President Nixon signs the 26th Amendment to the Constitution of the United States. On April 27, 1970 President Nixon sent a letter to Congress supporting a constitutional amendment to lower the voting age. At the time, the Senate had attached to the bill modifying and extending the Voting Rights Act of 1965 a rider that implied Americans aged 18 to 21 would be able to vote in federal, state, and local elections. The President pointed out the unconstitutionality of such a rider, citing improper use of Congressional authority in an area reserved for States’ consideration. I strongly favor the 18-year-old vote. I strongly favor enactment of the Voting Rights Bill. But these are entirely separate issues, each of which deserves consideration on its own merits. More important, each needs to be dealt with in a way that is constitutionally permissible–and therefore, in a way that will work. Though the bill was eventually approved by Congress and signed by the President, RN wanted to be sure of the constitutionality of the rider attached to the bill. Upon further review, the Supreme Court ruled that Congress had in fact overstepped its legislative bounds. Fearing a disoriented voting public in the 1972 elections, Congress quickly moved forward with a proposed constitutional amendment guaranteeing the 18 year-old vote. The Senate passed the proposal with a 94-0 vote. Soon after, the House of Representatives overwhelmingly approved the proposal, sending the amendment to the states to decide. 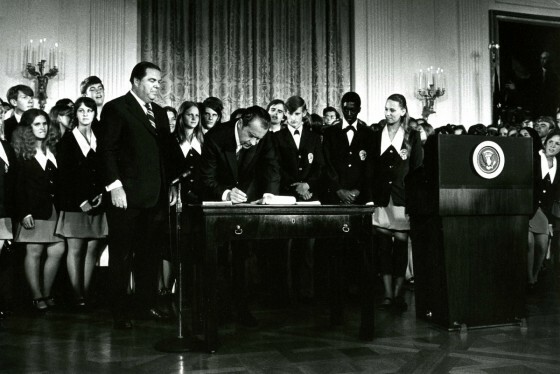 On this day 43 years ago, in a period of just over two months, 38 states ratified the amendment which prohibited state and federal governments from denying the right of U.S. citizens, eighteen years of age or older, the right to vote on account of age. The new constitutional provision, the 26th Amendment, garnered two-thirds of the states’ approval and was ratified in the shortest time of any amendment in the history of the United States. The ratification of this Amendment has been accomplished in the shortest time of any amendment in American history. This fact affirms our Nation’s confidence in its youth and its trust in their responsibility. It also reinforces our young people’s dedication to a system of government whose Constitution permits ordered change. The amendment assured that the young men and women who fully contribute to American society have a say in the country’s electoral process. Some 11 million young men and women who have participated in the life of our Nation through their work, their studies, and their sacrifices for its defense, are now to be fully included in the electoral process of our country. Student’s march in support of the 18 year-old vote.